In spite of the President’s declaration on Saturday that the dollar was “too strong”, King Dollar is holding its own and, in turn, gold continues to get battered. It has tumbled hard pretty much every day since February 20th. I wanted to mention, however, that it could be finding a reasonable area of strength soon. Miners, too, should be watched closely for support a little north of $21. I reserve most of the work on precious metals for NFTRH weekly reports and in-week updates because it is done on a consistent basis, with the work done previously key to the narrative making sense in real time and going forward. In other words, in order to not be out there stabbing in the dark you need to have an ongoing, adjustable plan that makes sense at all times with the macro markets around it. In honor of the men staring at silver’s daily chart, let’s highlight NFTRH 518’s Precious Metals segment this morning. We have 60% of the new trading week in the books and not much has changed for the PMs since this was written. You’ll notice that this man who stares at charts gets a little wordy at the end. There is much context that would-be gold bugs need to have in hand. To celebrate NFTRH’s 10 year anniversary (Friday, Sept. 28) I’d like to present one segment from this week’s report, NFTRH 518 each day until Friday. These excerpts will give you an idea of what it takes to provide a top tier, best of breed product. But there is much more to a single weekly report than will be shown here publicly. Oh and don’t forget the dynamic in-week market updates as events dictate. All for 30% less per day than you spend on your single cup of small regular coffee at Dunkin Donuts! Think about that. I mean, I don’t want to downplay the importance of coffee – it makes NFTRH run – but what is the value of consistent, focused and proven market intelligence at your fingertips day to day, week to week and year after year? US dollar rises (likely along with the Gold/Silver ratio) and the precious metals decline again into a real buying opportunity. A general review of the current status across different asset markets. This is not comprehensive, forward-looking analysis as per NFTRH, but it is an up to the minute summary (as of Friday afternoon). Gold, silver and Gold Stock indexes/ETFs made what I had thought were bear flags yesterday, but today painted them as short-term ‘W’ bottom patterns, in silver and the miners anyway. But the time to buy the gold sector is pretty reliably when the bugs are dead or at least hiding deep in the woodwork; so deep that you’d not even know they are still there. Just as you should have caution when gold bugs are trumpeting loudly, you should be brave when they are in full retreat… or worse, dead. On June 26 we provided an antidote to some media hysterics about a “Death Cross” in gold. On that same day we had an NFTRH update (still password protected, but below is the screenshot of the intro) illustrating for subscribers a developing positive risk vs. reward proposition in gold and silver. On June 28 we noted the out-performance by counter-cyclical gold miners to cyclical copper miners. 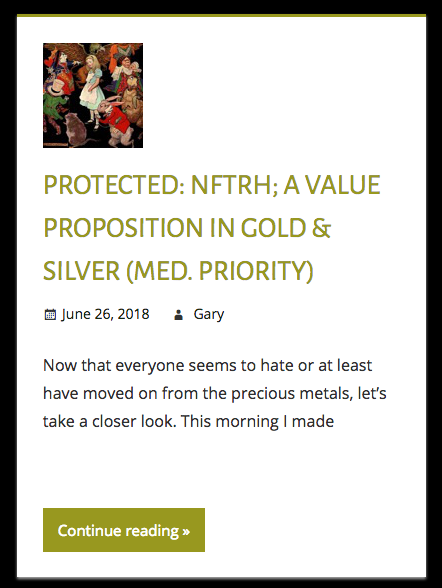 From this week’s Notes From the Rabbit Hole, an excerpt from NFTRH 502‘s Precious Metals segment, since I haven’t given the PMs much airplay on the public site lately. 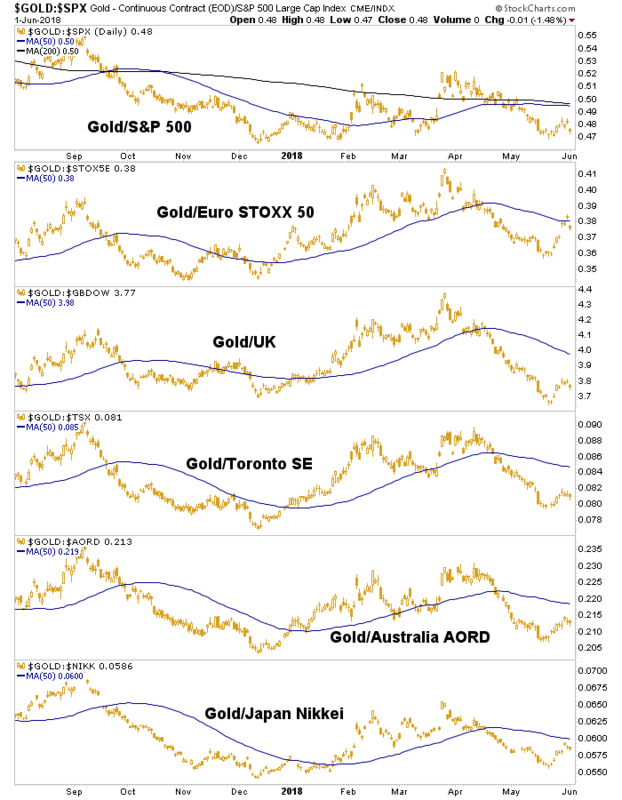 It gets a little prickly at one point, with some views on the gold sector’s perma-pompoms but then gets back on track. First off, let’s review some macro fundamental charts. We know that bond yield dynamics are not yet favorable and neither is gold’s standing vs. major stock markets. Gold vs. Commodities is still generally not good. Now, this (including gold/silver) is actually a sign that the inflation trades live on. Ref. our thoughts in the commodity segment that it may regenerate for one more thrust. An inflation trade can keep the gold sector afloat, but it is not the preferable fundamental backdrop for buying long-term positions. If this does not change I’d look to sell any decent rallies. With gold testing its 200 day moving average this morning I thought I’d reproduce the first part of the precious metals segment from week’s Notes From the Rabbit Hole (NFTRH 497), including a daily chart of gold at the end showing the anticipated SMA 200 test. We have done a lot of work delineating what the best investment environment would be for gold and especially the gold mining sector. The gold miners leverage (for better or worse) gold’s performance vs. cyclical items like stocks, commodities and materials. Gold vs. stocks is a macro fundamental indicator on investor confidence, or lack thereof. Gold vs. Energy and Materials are gold sector fundamentals directly informing a gold mining company’s bottom line performance (their product vs. mining cost inputs). When inflation is taking root and the economic cycle is up, the gold sector is suspect for the reasons stated above. It is and has been suspect to this point by definition, because gold is either in long-term down trends (vs. stocks) or has been flat lining for 2 years (vs. commodities). Let’s realize that gold and the gold sector can and probably would go up in an inflationary boom (assuming gold were out performing stocks) but the fundamentals would degrade as long as the economy remained firm.